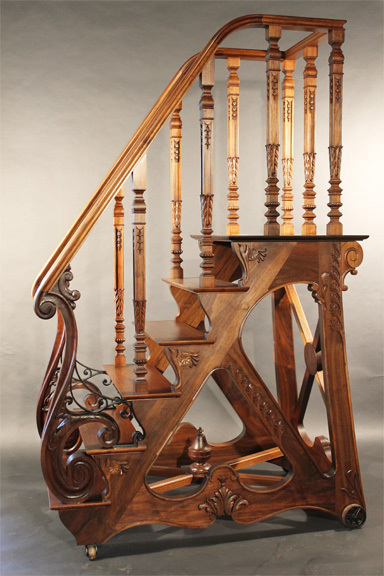 Our client emailed me a photo from a New York auction house that was offering a pair of ornately carved Library Ladders in the style and period of Napoleon III. They were being offered at a price in the six figures. Our client, naturally, wanted something quite like that, but for a fraction of the cost. We are always eager to accommodate our clients, and are especially interested in a new challenge. Our client was a collector and dealer in rare books, and in fact had an entire Back Bay apartment just to house and display his books. He had shelves built in to the ceiling, and needed to use – and access - all that space. It was very intriguing. As we made drawing after drawing, I offered to integrate carving motifs from the Celtic inspired woodwork of his period library. The final plan was similar in spirit to the original Napoleonic concept, but much more personal in design and scale. The end result was a Library Ladder that allows the owner to genuinely appreciate as well as access his beloved works.